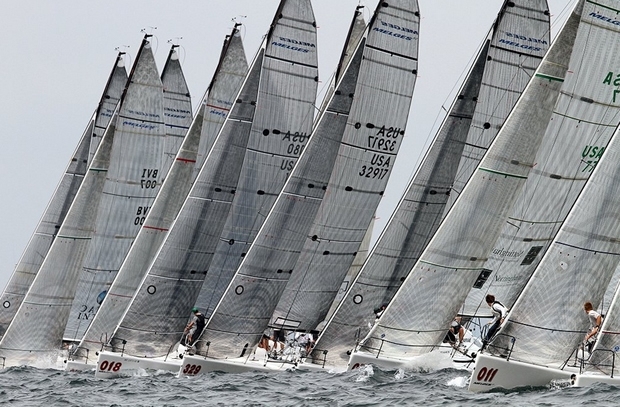 The second day of racing at the 2011 Melges 32 North American Championship, hosted by Sail Newport was splendid as three more races were completed leaving Ryan DeVos on Volpe and tactician Ed Baird in the overall lead. Annapolis' Rod Jabin and tactician Chris Larson aboard Ramrod are standing firm in second. Steve Howe on Warpath, with tactician Mark Ivey are third. The day started out under extremely light conditions. PRO Bruce Golison and race committee gave it an early start just north of Goat Island on the opposite side of the Newport Bridge. They were hoping that the light northerly breeze would have substance and be just enough to hold a morning time race prior to the forthcoming sea breeze in the afternoon. An extended onland postponement was put into play. The Race Committee soon communicated that it would be unlikely it would come down before 11.30 EDT. So, the teams waited. During that wait period, the bay breeze revitalized itself and the fleet was guided to halfway rock, just north of Pell Bridge for the official start of day two, races four through six. Sunny skies and warm temperatures set the perfect stage for three great races. The first race commenced about 1300 with Jabin, DeVos and Kip Meadows' roXanne seizing the first race of the day. Dalton DeVos' Delta and his cousin, Ryan kept things interesting as the two rounded the first windward mark side-by-side, William Douglas' Goombay Smash was third. Dalton DeVos overtook Ryan DeVos downwind, but to their surprise Benjamin Schwartz's Pisces snook in from the right to take the lead. Dalton DeVos gained upwind to trump Schwartz at the final weathermark of the race. DeVos' Delta took the win, Schwartz was second and Newport's Malcolm Gefter on Celeritas was third. Golison turned races around almost on a dime, with the second race of the day happening within a half-hour of the last finish. R. DeVos resurfaced as the team to beat as he dominated race two to win just ahead of the Howes' Warpath in second and Mark Plaxton's INTAC in third. The last race of the day offered up more unpredictability as to who exactly is able to win this championship. With the breeze, in some cases oscilating 30 degrees, it was again all about being in the right place at the right time. Jabin further delivered an astonishing performance to win, securing his second place overall position in the final standings. Plaxton took second and Howe was third. John Taylor's Ninkasi was fourth and William Douglass' Goombay Smash rounded out the top five. More complimentary beer supplied by Newport Storm at the Newport Shipyard. Owner's enjoyed a wonderful Owner's reception and cocktail party at Brown and Howard Wharf in the evening. Going into Sunday's races, R. DeVos leads by three, which is hardly considered comfortable in this highly competitive fleet. All eyes will be on Jabin and Howe for only one point separate the two, respectively seated second and third. Sunday is the final day of racing.